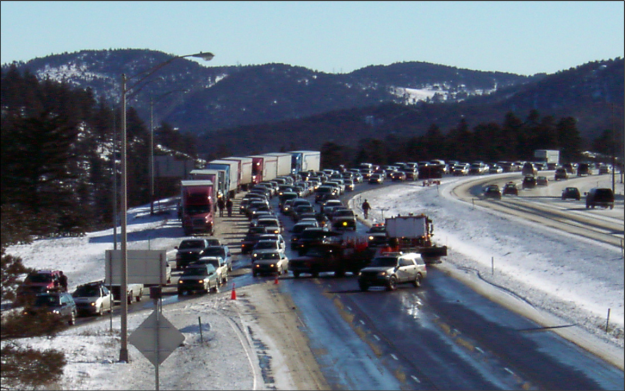 Interstate 70 into the mountains is frequently a traffic nightmare on weekends during the winter (I-70 Coalition photo). The well-documented traffic problems on the Interstate 70 corridor between Denver and Colorado’s most popular ski resorts in Summit and Eagle counties will hopefully be addressed this coming ski season with additional lanes in key choke points. If the new express lanes don’t significantly ease congestion that at times has led to 9-hour trips over the 100-mile corridor, look for more momentum to legislatively deal with the situation by enforcing fines for drivers not equipped with chains or proper tires who cause traffic snarls. DENVER – The High Performance Transportation Enterprise (HPTE) Wednesday approved the toll rates for express lanes in two major corridors, US 36 and I-70, which will soon begin operations. The US 36 Express Lanes Phase 2 tolls and special event toll rates will go into effect in early 2016. The I-70 Mountain Express Lane will open by the end of the year. The Board approved a toll rate range for the I-70 Mountain Express Lane that runs eastbound for 13 miles from Empire through the Veterans Memorial Tunnels in Idaho Springs. The lane will operate 72 days a year, and only during periods of peak travel such as the weekends and holidays. The base toll rate for ExpressToll account and pass holders is $3 and with typical traffic volumes, could range between $8 and $10. At high traffic volumes, the afternoon rate ranges between $10 and $15 or higher depending upon trip reliability and traffic volume. Drivers without a pass, using License Plate Tolling, will pay the toll plus an additional fee to cover the increased costs of processing the transaction without a pass. The two existing general purpose lanes are free and open to all travelers at all times. Click here for the I-70 Mountain Express Lane Tolling Fact Sheet. With the opening of the second phase of the project between Table Mesa and 88th/Interlocken, the US 36 Express Lanes Project will be completed. The toll rates approved by the HPTE Board vary at different times of day to manage congestion and ensure a reliable travel time in the Express Lanes. From Table Mesa to downtown Denver, the morning high peak (7:15 a.m.- 8:15 a.m.) is $8.75 with an ExpressToll pass. Without a pass, a surcharge is applied, and the cost increases to $16.33. At afternoon hours (3:30 p.m.- 4:30 p.m.), the ExpressToll rate decreases to $3.45 with an ExpressToll pass and to $8.70 without a pass. The toll rates for the same trip with an ExpressToll pass drop to $1.75 on Saturdays and Sundays and to $7.00 without a pass. The tolls apply to solo drivers in the new Express Lanes, which will also accommodate carpoolers (who will use the Express Lanes for free with a switchable HOV transponder) and riders on RTD’s Bus Rapid Transit service. The existing general purpose lanes on US 36 are not tolled. The Express Lanes are being managed and operated by CDOT’s partner on US 36, Plenary Roads Denver. The HPTE Board approved separate special event toll rates for sporting events, concerts or performances that generate significant traffic volume for US 36 and I-25. The purpose of special event toll rates is to maintain reliable travel times in the Express Lanes when traffic volume increases in the lanes and slows travel speeds. For example, when implemented, special event toll rates for drivers with an ExpressToll pass could be up to 60 cents on CU home football game days at the Westbound McCaslin toll point and the Westbound Overlook toll point, and up to 50 cents for Saturday events at the 1STBANK Center in Broomfield at the Westbound Sheridan toll point and the Westbound Church Ranch toll point. Drivers will be alerted when special event tolling is in effect via electronic message signs on the road and at toll points. The special event rates will not affect HOV drivers using a switchable HOV transponder. Click here for the US 36 Express Lanes Phase 2 and Special Events Tolling Fact Sheet. CDOT encourages motorists using Express Lanes on US 36, I-25 and I-70 to get an ExpressToll account and pass to save money on tolls every time. The electronic ExpressToll pass means motorists with a pass will be charged automatically for the toll and avoid additional fees with License Plate Tolling. ExpressToll accounts and passes can be obtained at www.ExpressToll.com or (303) 537-3470. The action by the Board today follows public outreach conducted in both corridors. Information from these events is available at www.coloradoHPTE.com. CDOT and HPTE will continue the public education campaign to communicate the toll rates for these Express Lanes, how to use the lanes, and how to get a pass. Toll rates for all corridors will be available at www.coloradoHPTE.com and expresslanes.codot.gov. When tolling commences, electronic message signs on both US 36 and I-70 will clearly display the current toll price prior to Express Lane entrance points, so motorists will know how much they will be charged.